I like this event, and Burton Town Hall is a good venue. And the parking is free. Fortunately, we got a nice draw ... the amiable Martins in the morning, and seemingly regular opponents Hutchby and Thorne in the afternoon. 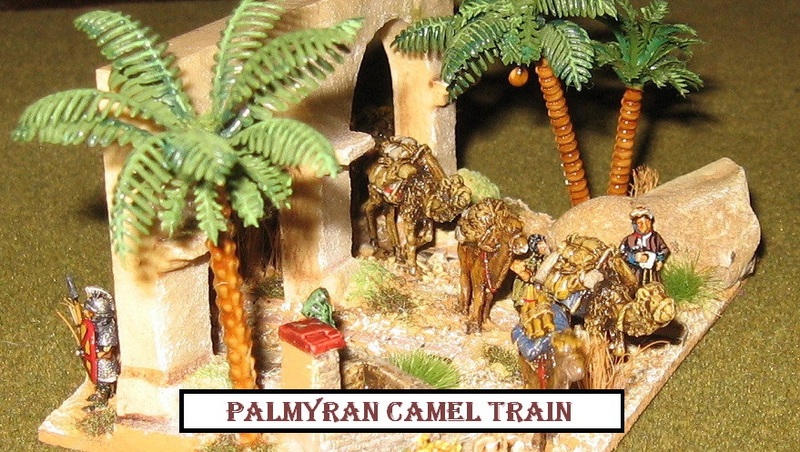 Another Palmyran, and some obscure Japanese, respectively. 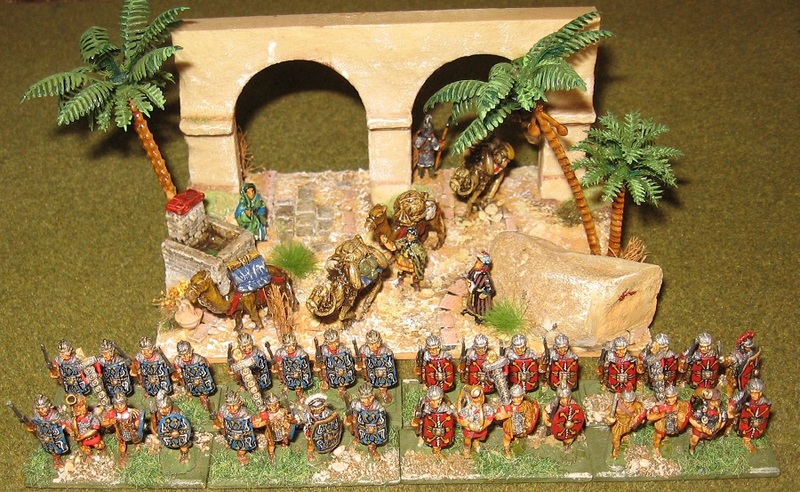 Palmyran armies vary from predominantly mounted Parthian-style Eastern armies to what are basically Roman frontier armies (Romans with extra cataphracts ....) ... It was one of these latter that Jayne and Andrew had chosen. But don't expect our game to resolve which might be the better choice. 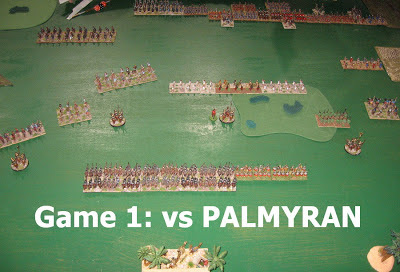 We lost 4 attrition points a piece (so the the score was 9-11 against us as our's was the smaller army ... more cavalry meaning fewer battlegroups). 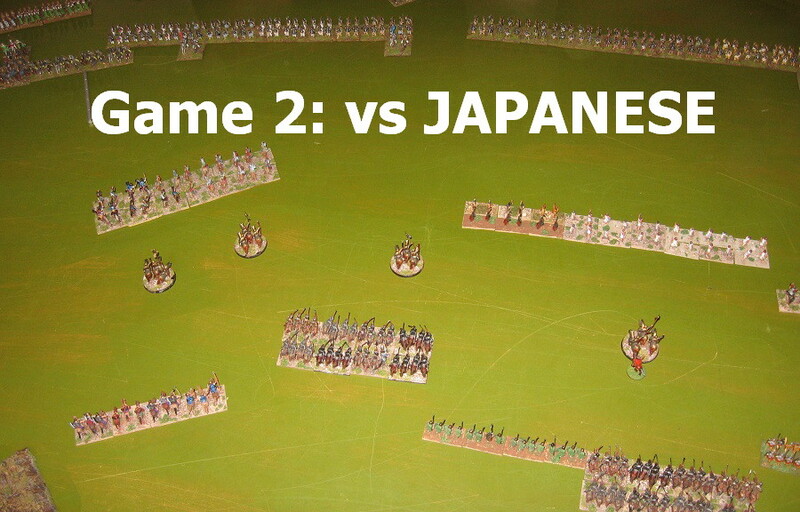 Against the Japanese we were miss-matched ... separated by 5,000 miles of geography and more than 200 years of history. The Japanese are a big army of archers which probably could not have downed a middle-eastern cataphract however much they shot - but who knows as the confrontation never happened (so there is no history from which to extrapolate). Undeterred, and with a game spirit, I advanced rapidly covered by skirmishers, and did succeed in getting the cataphracts into contact with these medium foot in the open. To no avail - another losing draw. Thankfully, they did. 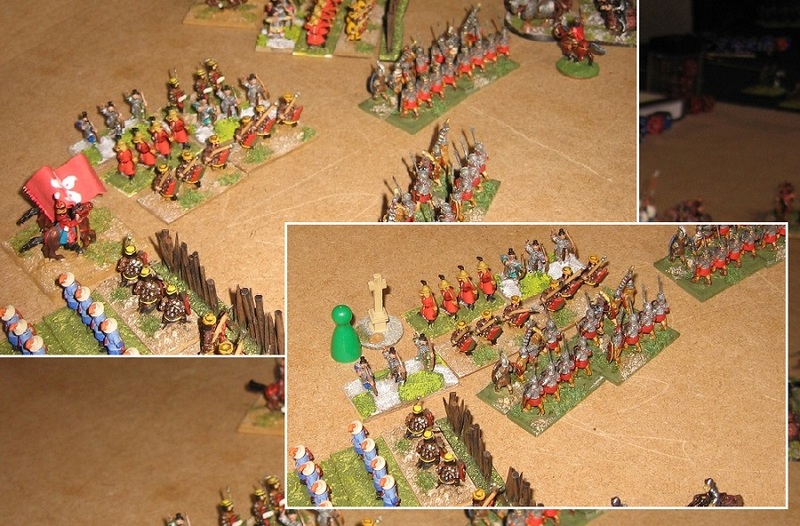 Whilst I was grinding through indecisive pulses of skirmish and counter attack on the flank, Chris piled in with a combination of armoured cavalry and armoured infantry against the Chinese centre ... Crossbowmen protected by armoured halberdiers behind field defences. 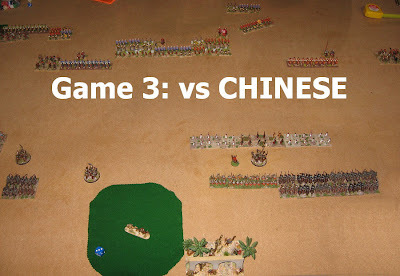 Fortune favoured the brave (for a change), and the desperate Chinese threw in their Inspired Commander (sun was going down on the game). He died too, and the wavering centre collapsed. The game ended before we could mop up ... a very gamely played score draw to us. We had played Lee at Usk last year and enjoyed big win, achieved mostly by my Aragonese high rolling late in an otherwise very even game. This was similar, but they had their revenge ... And the cataphracts who had performed so well in the morning were clearly tired after a good lunch. They took a couple of Roman units to the brink but could not finish them off. 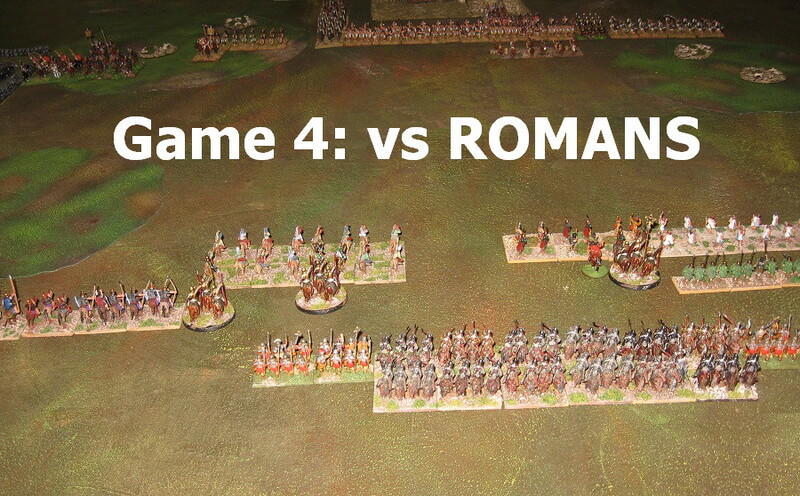 Both teams pressed on through the game turns to get a finish and on the game's last turn, the Romans got it. 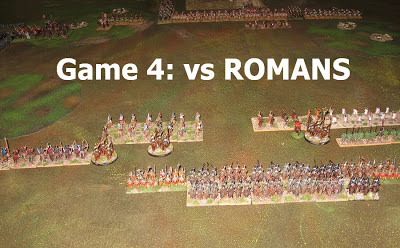 So, in all, a slightly below par outcome from a series of thoroughly enjoyable games. Although V2 seemed better, I think that was mostly down to us picking an army without spears and pikes in it. There was still plenty of nonsense playing out around the tables - just less gaminess in our encounters. Even so, we are now 8 games into V2 and have 7 draws and one result. With V1 we generally would expect 50% or better (not saying who would win ... just on the game getting completed within the time limits). Although I do think the game will have more traction in other periods, a 12.5% completion rate for a team that regularly gets results is not a good sign - and the interminably fiddly nature of FoG is entirely unimproved in this new version. 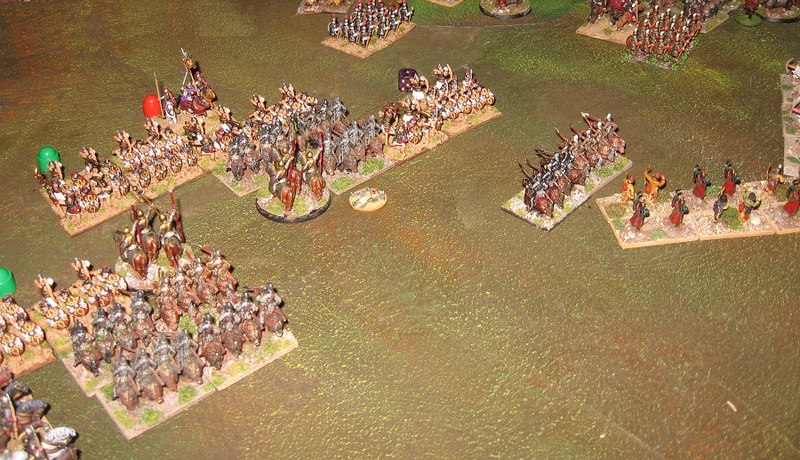 As an example, ranges for skirmishers have been reduced which produces fewer casualties. I can't see how this improves the game (skirmishers still slow the game down ... they just contribute less to getting a result). Infantry lines still kink implausibly to produce far-fetched flank opportunities (which consequently deter charges, again slowing the game). Nevertheless a weekend full of good things ... nice to catch up with old friends (and make some new ones) and good to see stalwarts like Adrian Garbett back wargaming ... Great terrain in our last game (I'm intending to copy this method), lots of nicely turned-out armies, great organisation as always ... and some predictable and unpredictable winners. Tim Child and John Hickman (Later Carthaginian) won the DBMM event, Dave Handley and Steve Royle (Classical Indian) the FoG-AM .... I understand Peter Kershaw won the best army prize with his Slave Revolt DBMM army - but I wasn't 'camera and notebook in hand' as I was on my way back from the stage where I had picked up the best baggage award. Yay! Good to see proper Ancients armies picking up all the prizes. 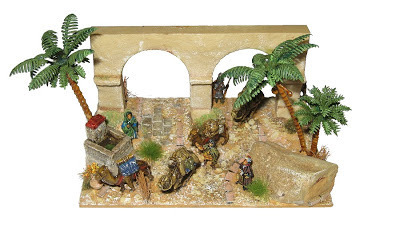 Since Queen Zenobia first mounted her camel, in the wargamer's mind, dromedaries have been associated with the fabled desert city ... Add to that Chris's comment on Palmyra ... 'Roman ruins' ... and I had my theme. The composition recycles several broken or redundant items from my terrain boxes together with a handful of camels from Chariot and Irregular, and a handful of figures - one each from Irregular, Gladiator and New Era Donnington (the Roman lady) and a couple of Middle Imperial soldiers from Chariot. Plus some cake decoration palm trees. The nebulous idea is that the army's baggage train is arriving or departing a defended watering hole or urban area well to the rear of the battlefield. A couple of soldiers guard the archways from the rear, to give the model more than one view point. 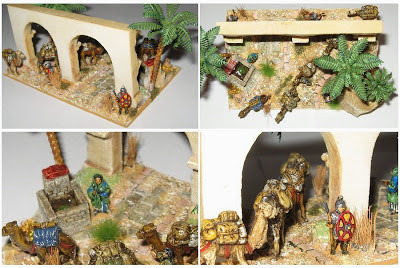 I have tried to indicate a bit of Roman style groundwork by glueing on some Warbases bricks and infilling with wood filler and sand. I'm glad they liked it. Palms, camels, pictures, decor, all is wonderful here! Great work, I love it!